Most journalists sub at some time in their career. Whether you are just starting out or need to further your skills, Digital Sub-Editing and Design aims to act as a useful mentor. This excellent book covers editing in the digital age, demonstrating the tools needed for effective text editing. Learn how to write powerful headlines and captions, and how to edit body text quickly and cleanly. It also concentrates on design in the digital environment, introducing typography and the related issues of readability and legibility. The skills of picture editing are explored, including image selection, cropping, manipulation and the ethics involved. These core skills and methods are then applied to the internet. Recent research into how people navigate web pages is considered, and recommends ways to write more effectively for the online medium. 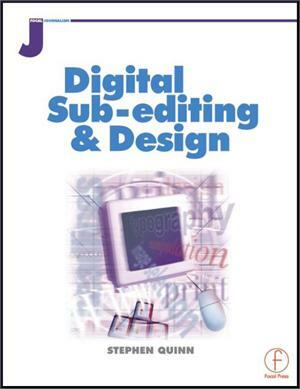 The first section concentrates on editing in the digital age, demonstrating the tools needed for effective text editing. Stephen Quinn shows how to write powerful headlines and captions, and how to edit body text quickly and cleanly. The middle section concentrates on design in the digital environment. Chapter five introduces typography and the related issues of readability and legibility. Chapter six covers the principles of design and how they can be applied to print and electronic publications. Chapter seven looks at the skills of picture editing, including image selection, cropping, manipulation and the ethics involved. Chapter eight investigates other forms of visual presentation such as diagrams, logos, maps and cartoons. In the final section, these core skills and methods are applied to the internet. Chapter nine considers recent research into how people navigate Web pages, and recommends ways to write more effectively for the online medium. Chapter ten examines how the principles of print design can (and cannot) be applied to web pages. Stephen Quinn is a digital media consultant based in the United Kingdom. He was the digital development editor at the South China Morning Post in Hong Kong from 2011-13. Prior to his return to journalism in 2011, he taught multi-media at universities in Australia, New Zealand, the United Kingdom, the United Arab Emirates and the United States from 1996. Between 1975 and 1995 he worked in all areas of the media in Australia, Thailand, the United Kingdom and New Zealand.